King of Indian Snacks: Haldiram Foods. Ever if Guinness Book of World records would hold a record for highest affection or love, it would definitely be Indian person and his or her love for Indian snacks! Well, using a hyperbole to express this was a right choice because nothing equals Indians fondness for snacks. 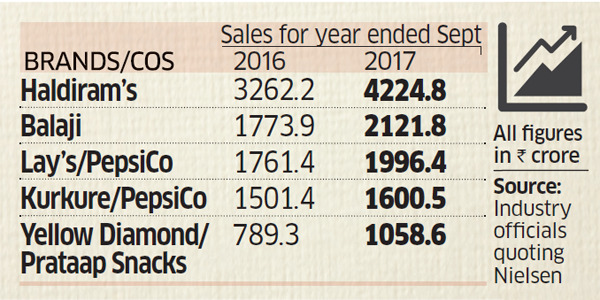 And the king of Indian Snacks Industry is Haldiram Foods. This million dollar industry is the leading manufacturer of packaged Indian snacks all around the globe. Haldiram’s was founded in 1930 as a shop in Bikaner, Rajasthan. The recipes and techniques are very much specific to them and that is also an important reason for their great success. While normal people admire Haldiram Foods’ for its taste, quality and hygiene, an entrepreneur is always busy admiring the scaling up the concept of Haldiram’s and its business plan. Haldiram’s is a perfect example for scaling up in terms of resources, sales and everything between it. It has a monopoly over this market and this is because of the right decisions are taken at the right time. Let’s take a look at Haldiram’s by through an entrepreneur’s eye. Founded in 1930’s, but still keeping up with the world and adapting to all the changes in the economy called this venture to be flexible. Growing up the shop from 1930, Haldiram’s established in Delhi in 1982. Back then, there was no mode of marketing, rather the term ‘marketing’ did not exist. What made Haldiram Foods different from others? The taste of Haldiram’s was a major factor for its popularity back then, it just spread like a wildlife in Delhi and the capital was built with the venture. You can say that mouth watering and mouth marketing were two pillars for the growth of the venture. Rightly said, money is saved by investing at right places and then came the time when Haldiram Company invested in scaling up their production and sales by starting a manufacturing plant. No compromise with the taste and every possible measure taken while packaging, to keep the product fresh and tasty, made Haldiram’s face all over the country. Did they stop there? No, they continuously worked for increasing their product range. As I mentioned, nothing could match the love of Indian for Indian snack the demand started increasing for Haldiram products in abroad as well. The USA is one of the first international markets that Haldiram Foods stepped into. The quantities exported in the international markets were huge, because of the large numbers of Indians in foreign countries. Again, the capital was built into the venture and they again decided to engage it by opening Haldiram’s eatery in major cities like Delhi, Calcutta and Nagpur. These places are really well-maintained and offer not only snacks, but other eating option. This all is making them paradise for food lovers. In keeping up with the market and technology, Haldiram Foods has also started to sell their products online on their site. See the progress, the plan and the execution to perfection without compromising with the product, and keeping up the changing technology has all contributed to its success. Success Story of Vijay Sales: All About Electronics Brand – How it all started?